All of us need to be hydrated all day, so personalized stainless steel water bottles aren't just for athletes. They are the perfect gifts for your customers, clients, employees and friends. 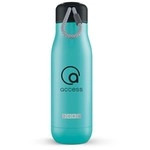 To keep them all happy, give them a gift from our collection that includes fat growlers, slim water bottles, high-volume sport bottles and impressive copper vacuum bottles from brand names such as Asobu, bobble, Contigo, h2go, OXO and Swiss Force. With many styles and materials to choose from, having sports bottles personalized to your brand image can make a modern, practical, and reusable gift. Whether your customers are immersed in the great outdoors, watching the game or taking a road trip, they’ll need a way to hydrate. So make sure your name will be right at hand. Choose one of many 15-ounce to 64-ounce options, or chat with a specialist if you’d like – they will help you determine the personalized metal water bottle that’s right for your brand. Custom stainless steel water bottles are the drinkware of the new era. Everyone can benefit from marvelously beautiful and useful custom metal water bottles. They're great for people on the go and they fit nicely in car cup holders, backpacks, and in the hand for drinking on the run. These steel promotional water bottles are incredibly durable and have the strength of steel fit for skyscraper construction. Design your own water bottle with products from ePromos that are sturdy, sleek and super sharp. They're the executive choice in corporate gifts and promotional items. Water bottles are excellent gifts for any occasion, especially for people that seem to already have everything. Pure metal water bottles are the right choice to represent the solid, superior, and reliable business that you are. These water bottles are great for team athletes, gym enthusiasts, and individuals looking to get out for a little recreation. Encourage physical health as well as mental clarity with logoed sports bottles that take care of your clients' needs. Besides being useful on the go, stainless steel looks fabulous parked on a desktop to accompany thirsty, busy work days, and accessorizes the sharply dressed professional. These sports drink bottles are ultra-modern, chic, and just simply divine. Non-porous steel drink bottles wash easily and thoroughly for fresh clean water every time, regardless of what you were drinking yesterday or last week. A reusable sports water bottle eliminates the need to buy disposable plastic water bottles. In addition, when you gift reusable water bottles, you can help care for our planet by keeping plastic bottles out of finite landfill acreage. Your clients will appreciate saving money by using this smart personalized sports bottle over the years. Choose the right promotional items that will best represent yourself to your public. Customize your own logo and brand message and create positive long-lasting impressions.